My friend is now enjoying the sun and the ocean in Thailand. I gave him a lift to the airport recently and in exchange he gave me a box with electronic stuff, wires, resistors and LEDs. The package included the NodeMCU board which is amazingly small. I first couldn’t believe that this is a “small computer” with the WiFi built-in. To explain you how newbie I am, I spent ~3 hours trying to connect it to my Mac (OS X El Capitan Version 10.11.1) before I realized that MicroUSB cable should be a proper one – the one which doesn’t only charges some device but is intended for data transfer. I used a MicroUSB cable from a Nokia cellphone. Connect a NodeMCU to your Mac. If not, as mentioned above, make sure that you are using the correct cable. I downloaded the float-version of the firmware to the folder with esptool.py. Make sure your NodeMCU is plugged in. Run ESPlorer.jar from Finder (you will need a Java on your Mac, obviously). Select in the connection dropdown box a serial connection to NodeMCU. Click Save and name the file as init.lua. Explorer should save the file, upload it to the NodeMCU and run it. You should see “Hello World” in the console. Now you are ready to build meaningful applications for NodeMCU. In the box that my friend gave me, there was a moisture sensor. The idea for the first application was obvious. I decided to measure the moisture level of the soil in the tree pot. I connected VCC to 3,3V pin on NodeMCU, GND to GND and AO to AO, pretty straightforward. -- Your Wifi connection data local SSID = "xxxxxxxx" local SSID_PASSWORD = "xxxxxxxx"
If you click “RST” button in ESPlorer two times, emulating button-down and button-up on a board, a NodeMCU will reset. Initialisation process will run init.lua from a device. If you play with the sensor values you will be able to understand when the soil is wet or dry. Don’t be afraid to put the sensor “legs” in the glass with water to identify the extreme values. I used an empty box from iPod player to pack everything together and connect to a tree pot. i tried to connect my moister sensor to my es8266, like you mentioned..
> I connected VCC to 3,3V pin on NodeMCU, GND to GND and AO to AO, pretty straightforward. next thing is that on the picture your wireing doesnt look like that you connected A0 A0 … on the right side of the nodemcu dev board there is no A0… or am i wrong ? Dom, thanks for the comment. Could you please confirm you’ve burnt the firmware as explained in the post? I think different firmware versions may be compiled with different ADC configurations. Please make sure you use nodemcu_float_0.9.6-dev_20150704.bin referred in this article. i dont know.. i think iam stupid…. …always get 65535 as value with the following code..
Aren’t you afraid of damaging the analog pin? I’ve read it only works with 0-1 volts, and my moisture meter (same as yours it seems) sends a 3 volt signal in dry soil and lower in wet soil. Aksel, indeed ESP8266 chip can measure analog voltages in 0V-1V range. However, if you use NodeMCU dev kit board also known as ESP-12, it has on-board voltage divider composed from 220k and 100k resistors, so you can measure voltages up to 3.3v directly. If you use any other board, it is likely that it does not have a voltage divider so you should add your own with parameters depending on desired voltage range. 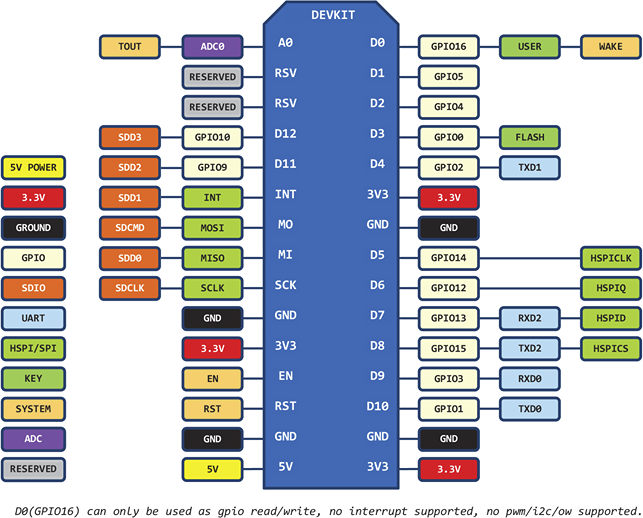 You can find schematics of NodeMCU devkit here https://github.com/nodemcu/nodemcu-devkit/blob/master/Documents/NODEMCU_DEVKIT_SCH.png. And I do not notice any difference in performance of ESPlorer with int and float firmwares, so I only can guess it depends on your custom files and code. Ah, a million thanks! Been fiddling with it for a couple of hours and could not understand the values i got when probing around. First thanks for the code example, the project is great. Just to help others newer than me, if you are not seeing the correct values is because you have not a firmware compiled for use of ADC. My suggestion is go to this web page> http://nodemcu-build.com/index.php and build an custom firmware and make sure you select ADC from the list of extra modules to be include in the custom firmware. Thanks again, great now lets play with it ..